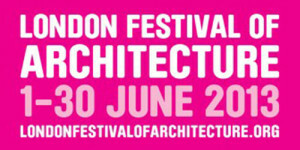 pH+ will be taking part in this years upcoming London Festival of Architecture 2013. The practice will be participating in the RIBA’s ‘Shoreditch Trail, Open Studios’ event on Saturday 8 June 2013. As one of a dozen or so practices based in Shoreditch, will be opening our doors to all from 10:30am to 5pm. The event is an oppourtunity for us as architects to reflect and communicate to members of the public what it means to be based in this part of London. We will be analysing and highlighting those projects located in and around Shoreditch, which have been the foundation of the practice since it’s inception 8 years ago. Visitors will then be invited to hunt through the array of physical models in our studio, to find colour coded figurines inhabiting only ‘local’ projects. Further information is available on the RIBA’s website, including an e-map identifying the practices involved and a list of ‘finds’ (items of interest) in and around Shoreditch to be discovered. Bike tours available. We look forward to seeing you on the 8th!